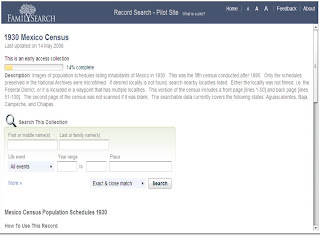 FamilySearch publicó los primeros cuatro estados indexados por nombre del censo 1930 de México. Los voluntarios del proyecto de indexación del censo ya pueden ver los resultados de sus esfuerzos en el Record Search. Yo no busco antepasados en México (Capaz por el momento), pero sé que para muchos es una gran bendición, poder contar con éstos documentos online. I was delighted to see this site but unfortunately I cannot read Spanish. I am hoping that some kind person could please do a look up for me. Your help would be very much appreciated. I am trying to find out about relatives of mine who went from Aberdeen, Scotland to Mexico. James was an accountant with the Mexico Power and Light co.
1930 Cafachinas 37 Mexico DF. John Lynde-Lockwood also worked for the Mexico Power and Light co. I would be very grateful for any help and any information at all. Unfortunately the census piece for the Federal District were lost. This was never filmed by FamilySearch (back then FamilySearch was called Genealogical Society of Utah). You may want to contact the Archivo General de la Nacion of Mexico to see if these were ever found.